This research aims to study the reactions of Diaminohexanoic Acid – an essential amino acid- also known as lysine at various pHs and further observe its absorption in a cactus species known as Euphorbia trigona. Lysine absorption was studied by observing physical changes in the Euphorbia trigona. Three pH studies were completed in solvents such as Methylene chloride, methanol, and water in the 25-40°C temperature range. This study was a small part of our on-going effort to develop assays for essential amino acid detections. The human body uses twenty amino acids to synthesize all the proteins the body needs. The non-essential amino acids are synthesized by the body. Essential amino acids are not created by the body and must be obtained from the diet. All amino acids have the same general structure that includes an α-carbon with single bonds to an amino group (-NH2), a carboxyl group (-COOH), a hydrogen, and a unique side chain, represented by the letter R. The side chain, or R group, is used to determine the identity of an amino acid (Figure 1). The three-dimensional structure and properties of an amino acid are very important. Amino acid side chains have unique characteristics such as polarity and charge. Amino acids can perform many tasks within the human body. Simply understanding how amino acids are detected, and proposing new questions could contribute to the development of novel and ongoing research . Figure 1: General structure of Amino Acids. Lysine is a positively charged amino acid with a basic side chain (Figure 2). Lysine is an essential amino acid that must be obtained from foods such as meat, nuts, eggs, soybeans, legumes, and dairy products. Lysine is absorbed in the small intestine. In the body, lysine contributes to inhibiting viral functioning, formation of collagen, calcium absorption, hormone production, and lowering serum triglyceride levels. Lysine is both glycogenic and ketogenic so it can help produce glucose and ketone bodies for energy utilization in the body. Free lysine can be stored in muscle tissues. The body conserves lysine more so than other essential amino acids. Lysine deficiencies can occur because lysine binds to sugar, therefore, the body cannot absorb lysine from sugary foods. Common signs and symptoms of lysine deficiency include fatigue, dizziness, weight loss, anemia, and reproductive disorders. Lysine deficiencies are usually detected in diseases such as herpes simplex virus, Epstein-Barr virus, anemia, and osteoporosis [2,3]. Glycated lysine residues have been investigated as a possible marker for non-enzymatic protein glycation in age-related disease processes. Glycation of macromolecules, such as proteins, leads to their oxidation. Oxidation plays an important role in many diseases. An experiment by Ansari focused on lysine rich proteins such as collagen and human serum albumin, and their role in aging and age-related disease processes was investigated. The experiment concluded that modified lysine residues may be a novel biomarker for protein glycation in aging and age-related disease processes . Peptides are groups of two or more amino acids bound by peptide bonds, C-N bonds. The peptide bond is formed by the α-carboxyl group of one amino acid and the α-amino group of another amino acid. Proteins contain at least one hundred amino acids bound by peptide bonds. Peptide bonds have resonance stabilization meaning that they can exist as either a single bond or a double bond between the carbon and nitrogen molecules [1-3,5-8]. The twelve plants used in experiment one where cut from one Euphorbia trigona plant. The plant was originally dark green in color and about 36” tall with small spines along the left and right sides. The plant was cut into 12 two inch pieces and placed in twelve standard Pennington pots. Upon cutting some parts of the plant leaked a watery liquid. The plants were divided into three groups based on the lysine solution that would be added to each group. Fifty grams of soil was measured and added to each pot then each plant was placed in. Measurements were taken of plant heights from top of the soil in centimeters as a baseline. Group A was watered with a 1 mmol lysine solution. Group B was watered with a 10 mmol lysine solution. Group C was watered with a 100 mmol lysine solution. On the first day, each plant was initially watered with 2 mL of lysine solution later in week 1 the amount of water was increased to 10 mL because the plants were dried out. The plants were watered every other day. In week 2, a 1 mmol:1 mmol solution of lysine and caffeine and a 1 mmol: 1 mmol solution of lysine and dopamine were prepared. 1 mL of the 1 mmol:1 mmol lysine and caffeine solution was added to plants A-1 and A-2 in addition to their 10 mL 1 mmol lysine solution. A-3 and A-4 will serve as controls for this group. 1 mL of 1 mmol:1 mmol lysine and dopamine solution was added to plants B-1 and B-2 in addition to their 10 mL of 10 mmol lysine solution. Plants B-3 and B-4 will serve as controls for this group. No additional solutions were added to Group C.
Experiment 2 is a potential of hydrogen (pH) study designed to explore how adding additional chemicals affects the overall pH of a lysine solution. Lysine was chosen because of its role in producing hormones, enzymes, and antibodies. The secondary chemicals used were two life bases, adenine, and guanine, found in DNA and RNA and three neurotransmitters dopamine, serotonin, and histamine. Caffeine was also chosen because it is a widely-used drug. Calcium chloride was chosen to be added as a third chemical to each solution because lysine aids in calcium absorption. Calcium helps build bones, muscle protein, and aids in recovery from sports injuries. Seven test tubes of 10 mL 1 mmol lysine solutions were prepared. The pH meter was calibrated using a pH 4.01 buffer initial. An initial pH reading of 5.86 was taken in distilled water. Then an initial pH reading of 4.13 was taken in the pH 4.01 buffer. The pH meter was calibrated by using the flat end of the spatula turn the 4/10 screw until the pH read 4.01. The next pH taken in distilled water was 6.48. The pH in pH 4.01 buffer was rechecked and read 4.01. The initial pH in pH 7.00 buffer was 7.26. The pH meter was calibrated until the pH read 7.00. The initial pH in each test with the lysine only solution was recorded. The initial pH in each test with the lysine only solution was recorded. The pH value of lysine was calculated to be 7.12 based taking the average of the three pKa values listed in the Merck Index . Experiment 3 was also a pH study but its primary goal was to develop an assay to detect free lysine using thin layer chromatography under different pH and temperature conditions. The first step was to do solvation studies. Two alcohols methanol and methylene chloride were used as solvents so the TLC experiment was starch based. TLC was chosen because it is more affordable option than other separatory techniques but still provides accurate identification of amino acids. Mass spectrometry is a more precise and faster method available to study proteins but it is more costly. A few of the plants showed a small amount of group. All the plants in group A changed color from being green initially to developing yellow and white areas by the end of the experiment. All the plants in group B showed significant color changes except for B-2. B-2 had less yellow and white areas than the other plants across all groups. B-2 received the same lysine solution and 1:1 solution as B-1 but they did not have similar color changes. B-4 was also unique in that the edges had a plastic looking appearance and the plant fell over and withered. It received the minimum 10 mL of water like the other plants. Group C had consistent results. Most of the plants did develop yellow areas but white areas were more prevalent. Several plants in all three groups also developed dark horizontal bands or lines along the top. The bands may have affected their growth because a lot of the plants showed very little to no growth. Several but not of all the plants in each group also grew small red needles. For weekly plant observations refer to supplemental materials. The test tubes each initially had a 1 mmol concentration of lysine and the initial pH ranged from 6.33-6.50. All solutions were initially clear and had one layer before the second chemical was added. Each second chemical was prepared as a 10 mL 1 mmol solution. Each secondary solution was added to one of six test tubes. The seventh test tube served as a control. Guanine was initially the only chemical that did not appear to be water soluble it had a small amount of white straw like precipitate on the bottom of the test tube. The other solutions all remained clear and miscible with the lysine solution. The pH of the combined 1 mmol lysine and second chemical was taken. On the day, the second pHs were measured test tube 3 had small white flurries and one large white circle on test tube glass that were new. Test tube 4 still had the white solid precipitate on the bottom but it was more circular than straw like and had new small white circles and white straw-like particles on interior of test tube. Test tube 6 had a little white film on test tube. All the other test tubes remained clear and unchanged. Most of the second pHs of the solutions decreased from the initial pH even though most of the chemicals were bases and were expected to increase the pH. In test tube 2 and 5 the second pH increased. One milligram of calcium chloride was added to each of the six test tubes. On the day, the calcium was added test tube 3 and 4 still had white circles and flurries on the glass. The guanine precipitate was still visible in test tube 4. The addition of calcium did not appear to have an immediate effect on the solution and the solutions remained miscible. The pHs of the six test tubes were measured again. On the day the third pHs were taken the white precipitate at the bottom of test tube 4 appeared to be slightly less in amount. Test tube 5 was slightly cloudy and had formed two layers. There was a small amount of a second layer on the top of the solution. The third pHs of the all test tubes increased from the second pH. Test tubes 2 and 4 had higher pHs than the first pH recorded with the lysine only solution. It is believed that lysine had some reaction when both the second chemical and calcium chloride were added because the pH changed. Table 2: Solvent Methylene Chloride. 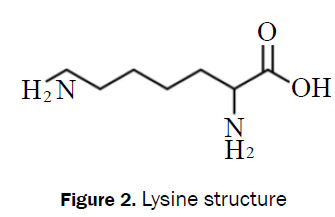 The results show that lysine could not be detected via these simple methods. More technical approaches need to be studied to detect this chemical. Further studies are encouraged as follow-up to this experiment. Experiment one examined physical changes that occurred in the Euphorbia trigona plant when exposed to different solutions. A few of the plants had a small amount of growth. Nearly all the plants had significant color changes from the formation of white spots to a yellow crust. Experiment two was a pH study to examine how the pH changed when other chemicals were added to a solution. The pHs behaved differently than expected because the second pH was lower than the first pH in most test tubes even though mostly basic chemicals were added. The third pH measured in most of the test tubes rose. The changes in pH showed that a chemical reaction took place when Diaminohexanoic Acid was mixed with the other chemicals. Free Diaminohexanoic Acid was not detected against a pure sample therefore we recommend further studies as little research has been published in this area [9-11]. Campbell M. Biochemistry. 6thedn. Brooks/Cole Publishing Co., Boston, Massachusetts, USA, 2008; pp: 65-80. L-Lysine. Alternative Medicine Review 2008;12:169-172. Ansari N. Glycated Lysine residue: a marker for non-enzymatic protein glycation in age-related diseases. Disease Markers 2011;30:317-324. Copstead LE,Banasik JL. Pathophysiology. 3rdedn.Elsevier Saunders, USA. 2005; pp: 1075-1077, 1134, 1193-1200. Horton H, et al. Principles of Biochemistry. 3rdedn. Prentice Hall, USA, 2002; pp: 600-606. Miyagi Y, et al. Plasma Free Amino Acid Profiling of Five Types of Cancer Patients and Its Application for Early Detection.PLoS ONE 2011;6:e24143. Strecther P, et al. The Merck Index. 8thedn., Rahway, New Jersey: Merck & Inc., USA, 1968; p: 633. Wade LG. Organic Chemistry. 8thedn., Pearson, USA, 2013; pp: 354-357, 879. Zakrewski R, et al. Detection of proline, arginine and lysine using iodine-azide reaction in TLC and HPTLC. J Separation Sci 2003;26:1063-1066.